I can’t tell you how long I’ve been talking about making jeans. Well, actually I can. It’s only been about a year. In the grand scheme of things, that’s nothing. But, considering a year is nearly as long as I’ve been engrossed in this whole sewing nonsense, it feels like a long time to me. My pattern of choice: Jalie 2908. I blame Tanit-Isis. That woman makes a pair of jeans a week, I swear, and they’re all from this pattern. With that kind of endorsement, how could I use any other pattern? For the past year both the pattern and the denim have been sitting in my meager stash just waiting for me to make the time. Over the summer I found the time to trace the pattern in my size, but not the time to make the jeans. This past fall I found the time to cut all of the pieces out of denim, but not the time to turn on the machine. Each time I thought about it, some more pressing project at work or home came up. I think I was really just afraid of making pants. I finally got motivated this past week thanks to the Sew Weekly‘s theme, “Unfinished Objects” or UFOs. I was determined to get these jeans sewn up so that I could show them off over there. And, things were going so well. It turns out jeans are pretty easy to put together. Especially thanks to clear pattern instructions. The tricky part was learning how my machine wanted to handle the thick layers of denim. I have a little sore spot on my thumb from turning the hand crank so much! Then, disaster struck. I ran out of thread. All I had left to do were the belt loops, waistband, and hem. “No problem,” I thought. “I’ll run out to the store tomorrow and pick up more thread. I’ll be wearing these jeans by the end of the weekend.” Unfortunately, the store I chose had a poor selection of jeans thread. Nothing they had matched what I had been using. Discouraged, I left without the thread. The jeans remain as you see them above, a little raw on top and bottom. And, my 2012 Sew Weekly streak is now broken. The jeans look amazing so far, though! I’m terrified at the thought of making jeans. As I work in the clothing retail business. It is very common to see jeans with more than one color thread. Find another Color and keep going! You are too close to being finished! Haha! I had the same experience recently in my jeans endeavor. I got in a really good groove, too, and no place in town had the thread in stock. I ended up ordering 10 rolls from Joann.com but by the time it arrived my mojo had faded. Whoa, I can’t wait to see these! They look amazing! You are tackling some TOUGH stuff this year!!! Ooh, good luck. On the one hand I feel super excited for inspiring someone, on the other hand I will feel totally guilty if they don’t work out. Eeeeee! I hate that too!! Made the mistake one day of running out, when I only bought one spool of thread. Now I always buy two when buying fabric. It does mean I have leftover thread, but at the end of the day it get’s used up for sewing toiles, basting etc. 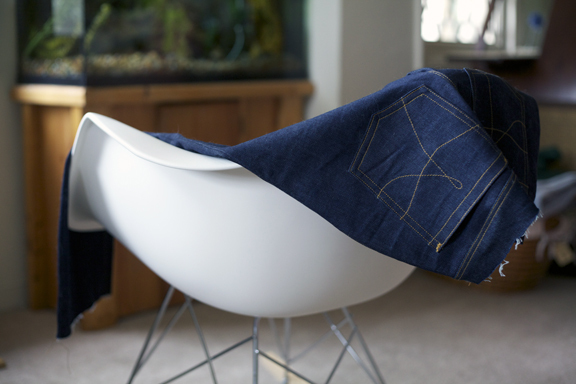 Your jeans are looking great – can’t wait to see them finished and I’d always wondered about jeans – i.e. which were the good patterns. Thanks for your recommendation on Jalie. No worries on my being disappointed. They are far enough along that I can try them on, and they fit well! I’m very happy! We’ll see if I decide to change things in my next make, but so far so good! They look amazing so far! Can’t wait to see them finished! And to answer your question… yes – I’m in the north bay. In fact, I saw that you RSVP’d to a meetup that I’ll be at. Looking forward to meeting you in person, Amy. They look so cool already! I made my first pair this year and I also used Jalie instructions (the pattern was my own). I didn’t use topstitching thread but a triple stitch feature on my machine. You get to use regular thread but it turns out thicker because it goes over the stitch 3 times. I had to make the buttonhole by hand because it was not working out on my machine. They look fabulous so far! And I feel your frustration. There is nothing worse than being in the sewing zone only to find you have no thread/zipper/interfacing available. Aargh! I can’t believe the store had nothing in stock. Hope you have find a suitable thread very soon. I can’t wait to see the finished product. Jean fabric is something I have never worked with before, and it looks challenging – your top-stitching looks beautiful! A year is nothing! All I needed was to sew on the waistband and finish the side seams on mine. For six years. Construction is pretty easy, right, save for all the thick areas. I found it was simply the fitting that took a while. These will be great!!! The jeans are coming along well. Beautiful topstiching. I cant waint to see them when there done. Reminder to self: buy ample thread! Don’t get discouraged. We look forward to seeing them. I love your back pocket detail!! 🙂 It almost makes me want to tackle jeans sewing just so I can do that with a scripty ‘L’ 🙂 good luck finishing them up! your jeans look great – very inspiring to read your post. So, sorry you ran out of thread when you were SO close to being done – grrr! frustrating. I’ve now actually finished these jeans! I struggled a bit with the waistband since it’s cut on the bias, but it all worked out. Just take care not to skew it when you’re working with the band, otherwise you might have to spend time with the seam ripper like I did! I’ve worn the finished jeans a few times, but I haven’t had time to get photos. This weekend, hopefully. Good luck! !